Beautiful sink I would definitely recommend to friends! Solid, durable tempered glass finished in rich russet makes the VIGO 18 in. 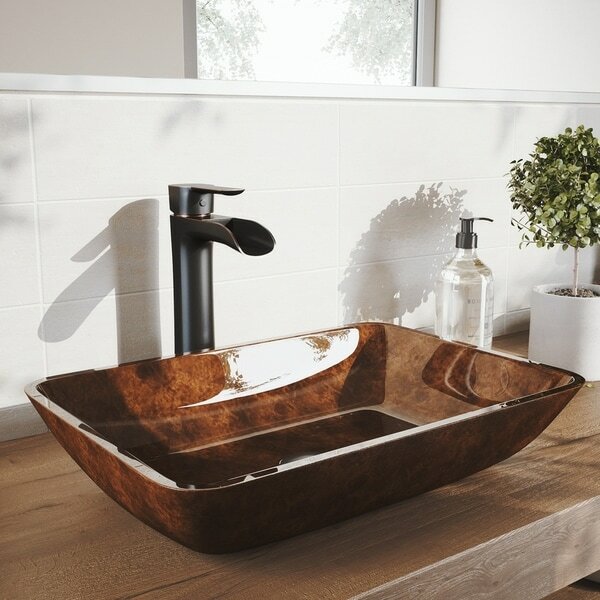 Rectangular Russet Glass Vessel Bathroom Sink as strong as it is stunning. This handmade rectangular vessel bowl bathroom sink is built to be a long-lasting statement piece in your home. This set includes the VIGO Niko Vessel Bathroom Faucet in antique rubbed bronze, as well as matching pop-up drain and optional mounting ring. I purchased this set for my guest bathroom and I love it. It has an old world decor look to it and it was a plus to get the faucet with it as that cost $ by itself. So happy with my purchase! Sink set arrived in a professionally well designed box. I knew this was a quality product before I opened it! The sink was more beautiful than the online picture with fine etched detailing in the bowl. The faucet came with all parts needed. Can’t wait to use the whole set. i Was looking for a vessel sink in warm tones. After many hours of searching I found this set, I ordered it thinking if I do not like it I can return it since overstock is good with returns. I received my set, it is beautiful, colors are rich, and quality is high. Definitely recommend the set. These sinks are absolutely gorgeous. They arrived with everything necessary to install - packaging was a lovely as the items! We have not installed as we're still waiting on the counter to sit them on but the quality of the glass and design of the faucets is exactly what I wanted. These are beautiful sinks. The faucets are quite large but once assembled it looks great with the glass sink. We bought two of these sinks for our master bathroom. The installation was easy, and they are absolutely gorgeous! The color is rich and deep. They do show every drop of water, however. I bought this for my guest bathroom and it is absolutely beautiful. The color is gorgeous and it looks absolutely stunning. The quality is excellent and this was a great value. Quality material, looks fantastic in our rustic bathroom. Was easy to install, good instructions. 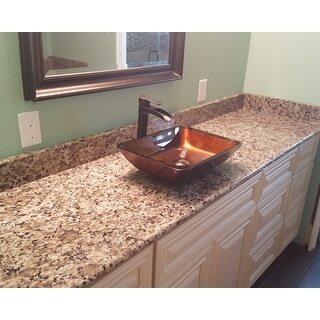 I absolutely love my new bathroom sink. This sink is even more beautiful than I thought it would be. I can't wait for the contractor to get to the point where he installs it! It's really going to take the bathroom to a new level. Absolutely gorgeous! Nice size and the quality is excellent! It’s better than i thought. Just beautiful. Very nice product. Great delivery time. This sink is so pretty. I love it. Master Bath project completed ! sink is Fantastic ! wish we could post pics ! "Does this come with a pop up drain and mounting ring? " yes, the pop up drain is included.